Bullshift (aka – Shift de nuit) – Galerie du Nouvel Ontario, Sudbury, 2011. It is easy to see that animals are valued as part of our national identity. When we look at the change in our pockets, we see loons, polar bears, caribou and beavers. When we talk about money, we often speak of animals. Animals help illustrate economics, notably the bear and the bull to describe the stock market. Bear markets are sluggish, and the collective mood is pessimistic due to economic decline. A bull market describes a fast moving and powerful market, a time when investor confidence is high. When pictured together the two animals are often pitched in battle – the bull attacking with its horns from above, and the bear swiping low to knock the bull from its feet. But can the bull and the bear work in tandem? ‘Bullshift’ examines this possibility. ‘Bullshift’ was originally produced under the name ‘Shift de nuit’ as a residency at les Jeux de la francophonie canadienne in Sudbury. Shady Bales was invited to spend a week doing shift work overnight like the miners that dominate Sudbury’s industry. The resulting installation was available to the public from 6pm to 6am. During the shift Shady Bales solicited individuals to contribute a nickel to power a coin operated bull. 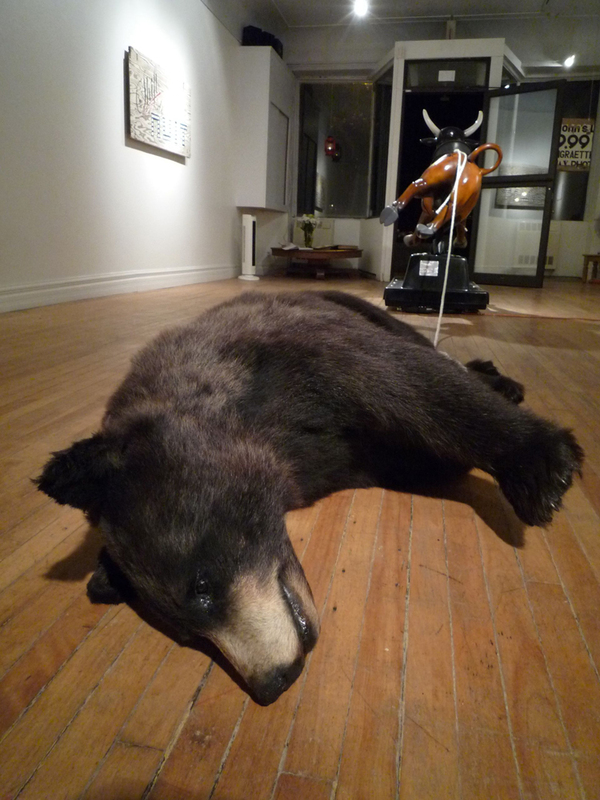 Tied to the bull, a taxidermied bear remained “dead” on its side, never dragged to its feet regardless of how many nickels were collected. This was the second work for Shady Bales, my collective with Geneviève Thauvette.